I can't feel my nose and thus didn't notice the drop of mucus drip from my numb hooter to the pebbles beneath my feet. I am freezing cold. According to the Met Office we are on course for the warmest November for some time. I seem to have pitched up in the place that is the exception to this balmy rule. It is early morning on Thurstaston Beach and the sun is just rising. The wind is by no means strong but it is enough to chill me to the bone. It makes my decision to come here questionable, but I'm feeling good now I've shaken off the photographers block after my encounter with the Hilbre Short-eared Owl. 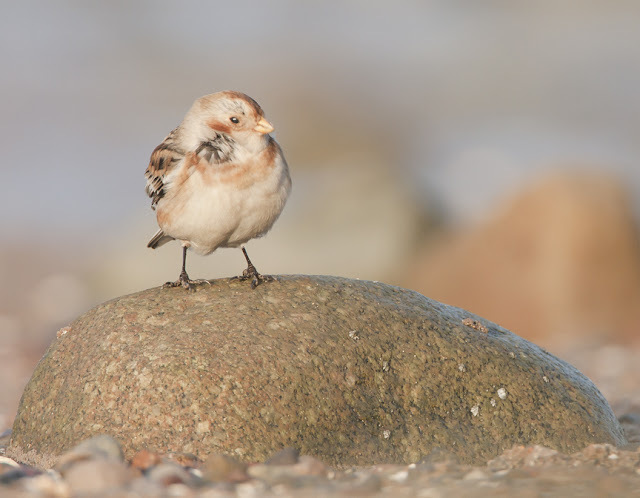 I had recieved a text message the previous afternoon telling me about two Snow Buntings that had been found on the shore. I had no camera with me so decided then to make the early start the following morning in the hope of catching up with them before work. Seemed like a good idea in the warm office, foolish now. 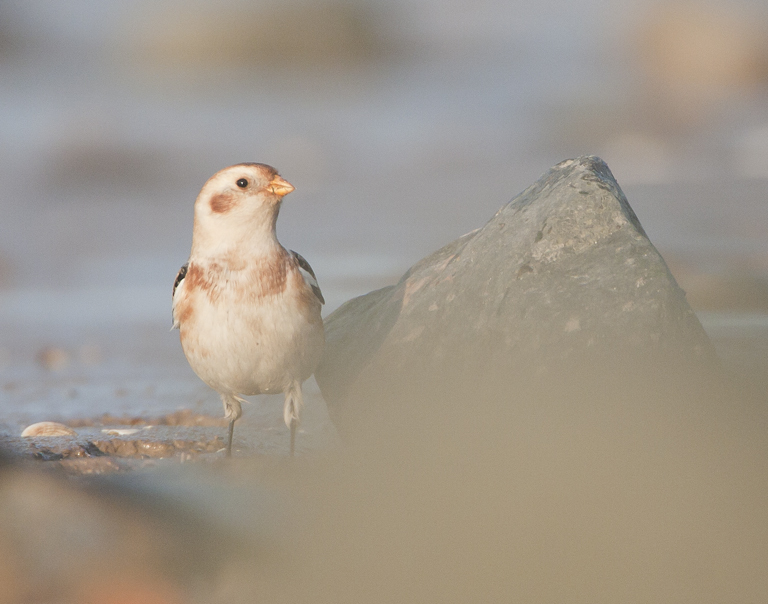 The beach is big and the birds are Sparrow-sized and used to migrating huge distances. Could they still be in the same place as yesterday? Yes! I spot the 2 birds a few dozen yards in front of me. I quietly skirt around them to get the sun (when it rises above the cliffs) behind me and illuminating my subjects. I give them plenty of room and settle down on the sand. These birds can be tame so with luck they will come and check me out, I'll take their pictures, they will carry on feeding - everybody's happy. I start to take pictures and sure enough they start to wander in my direction. 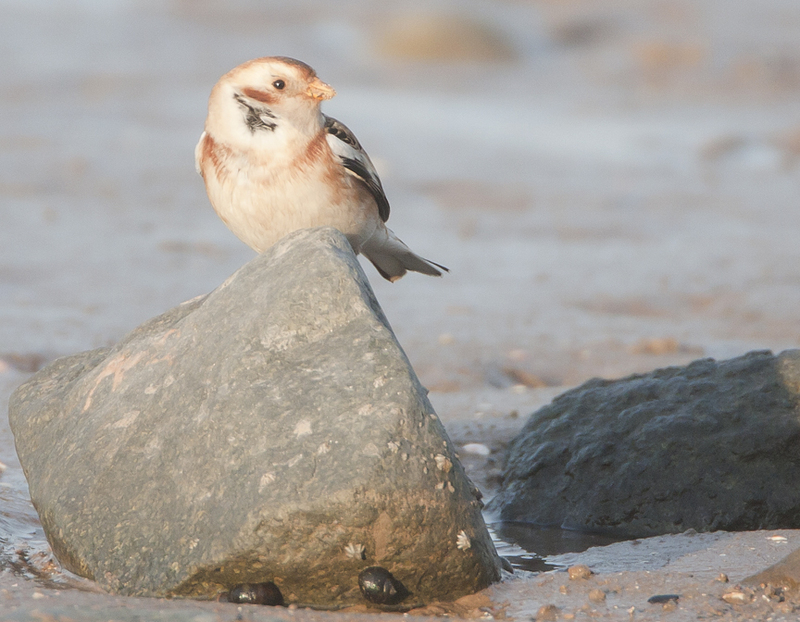 They are feeding on seeds that have been brought in by the tide and blown up the beach to the cliffs. They stay close together, never more than a few feet apart. 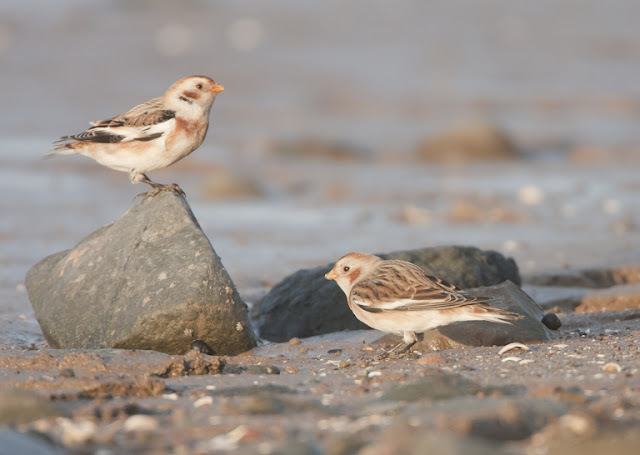 Grains of sand adhere to their bills, mud gets between their toes. A rabbit hops along the cliffs, it startles the pair. They fly to the muddy edge of the beach. The male is wary now, surveying the scene from behind a rock. His confidence returns and he is soon stood on the pointy stone with his partner close by. 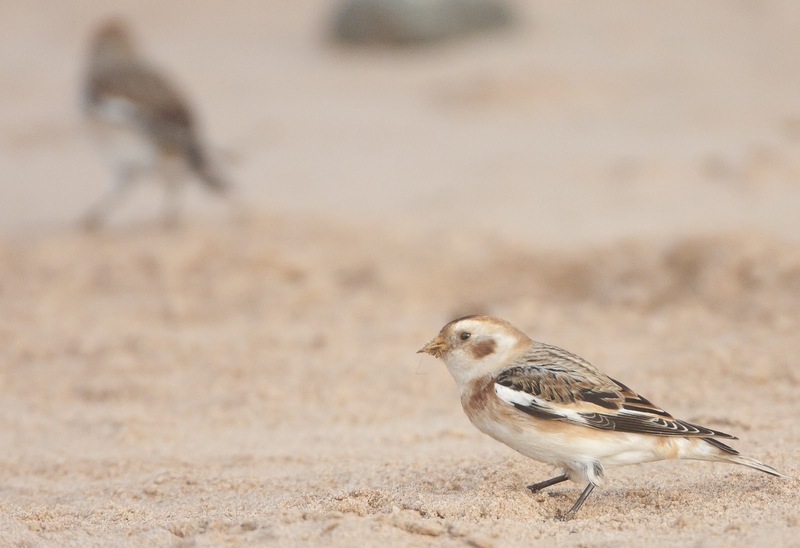 The wind is still blowing along the beach but I don't feel it's coldness, all my consciousness is taken up watching, studying, appreciating and photographing these amazing birds. The wind ruffles the dense feathers of the male's face. He seems well insulated. The windproof-ness advertised on the sleeve of my fleece turns out to be a lie, but I'm not fussed now. The sun is up and the mercury is rising slowly but appreciably. The female finds her own rock to perch on, the wind ruffles her face feathers too, she squints in the morning sun. 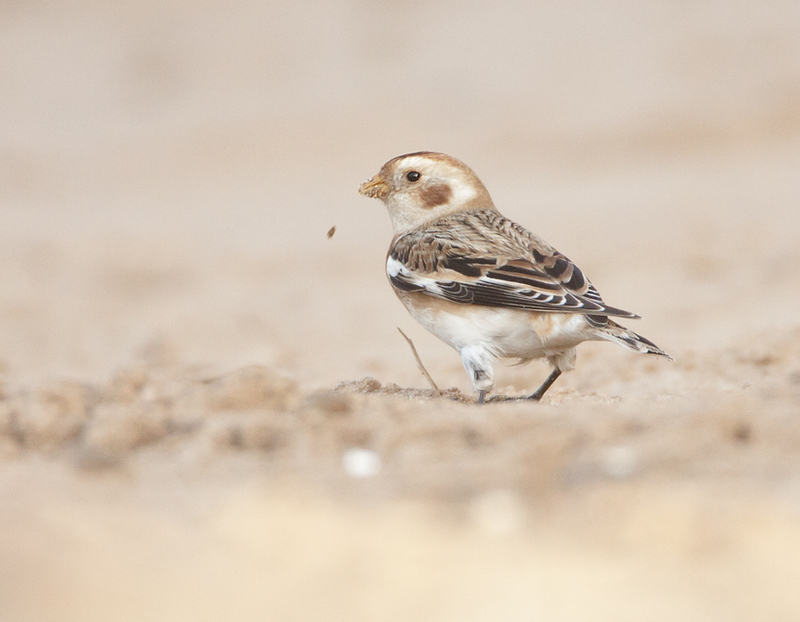 The birds carry on feeding, the odd careless insect is scoffed with copious ammounts of seed. I can feel the lack of food in my belly. Breakfast beckons. 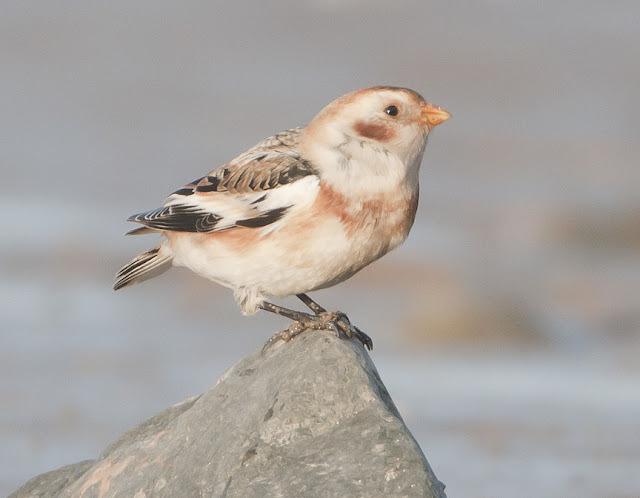 Regular readers of this blog will remember the start of my Breakfast Club back in March. 2 more new members were joined today. I glance at the watch and see it's time to head to the office via a cafe, only one thing will do now - bacon butty! .... and I have total respect for these birds.